You’ve probably noticed that I posted the alternate project for Block 2 yesterday — the Wildflowers Pillow. I’ll be back tomorrow with Block 3 — I wanted to post it today, but I can already tell I’m not going to have time to get it posted because some things more important than sitting in front of the computer have been scheduled for me! I’ve also changed the sidebar to make it easier to find the patterns for each quilt-along. I figured that information might come in handy if you’re looking for past patterns (or have fallen behind like I have). Because . . . I know we have quite a few new followers and participants. So, welcome all you newcomers — I’m anxious to see what you all do! I’m not completely finished with the new sidebar yet, but I’ll finish it up as soon as I can. I made a new downloads page — something I never got done after launching my new web site and breaking them all, but hey, baby steps. It’s not finished yet, either, but I’m working on it slowly but surely. This is a lot of work! Please bear with me . . .
And remember, if you have a finished block you’d like to show, you can send me a picture and I’ll do occasional posts featuring them. I would love to see them, and I’m sure everyone else would, too. Oh, and we were featured on We Love French Knots the other day! I think that’s all for now. Check back tomorrow for Block 3. I hope you have Blocks 1 and 2 all caught up! I’m including a list of the basic tools and other supplies you’ll need to make this quilt. I encourage you to use whatever your favorite tools are, but I’m listing what I use below. I did this for the first quilt-along, but since we’ll be doing some applique this time, there’s a few more things to add and talk about. Sewing machine in good working order, with a new needle (to start out with) and plenty of bobbins on hand. The piecing is not difficult, so a simple straight-stitch machine will be just fine. I recommend a new needle because it makes such a difference, and I want your project to hum along without any stress. It’s also handy to have a few bobbins wound ahead of time, so you don’t have to stop sewing to wind more. A rotary cutting mat and ruler(s). I always recommend to my students that they buy the largest cutting mat they can afford. While I assume that most quilters already have one, if you are a beginner, or are in the market for a new one, get a big one! I will also assume that most quilters have a ruler or two laying around somewhere, but just in case you don’t, the best size for this project is going to be a 6″ x 12″ ruler. Toward the end, a large square ruler, like a 16″ x 16″, might come in handy, and for straightening up fabric or cutting borders, a 6″ x 24″ ruler could be useful. However, if you don’t have any ruler at all, and want to buy only one, get the 6″ x 12″ one first. A good rotary cutter. I use a Martelli ergonomic cutter, the 45mm size. I can cut for hours without even noticing. I’ve tried every kind, but I now think I can’t live without my Martelli. They say they’re in the process of redesigning it, so it should be even better in the future. My second favorite choice would be the Fiskars 45mm rotary cutter. And I wouldn’t be totally against using an Olfa cutter, either. I just can’t use one for an extended period of time without it hurting my wrist and hand. For this project, don’t get the little tiny rotary cutter. It’s too much work. The 45mm, whatever your favorite brand, will be the best. And since you’re only doing a little each day, you shouldn’t tire yourself out with cutting no matter which brand you’re using. Thread. You’ll need a spool of thread in a neutral color that goes with your fabrics. I used white for mine, because my background was white, and I didn’t want a color to shadow through. This thread is for the piecing part. I’ll discuss applique thread farther down the page. Storage bin. I really recommend a bin of some type to use for storing all the pieces and parts of this project all in one place. Since we’ll be working on it over the course of several months, you don’t want to have parts of it scattered everywhere, and you’ll want to be able to pull it out and yet put it away easily when necessary. If it’s all in one bin or drawer, that will greatly simplify things and hopefully prevent you from losing anything as you go. 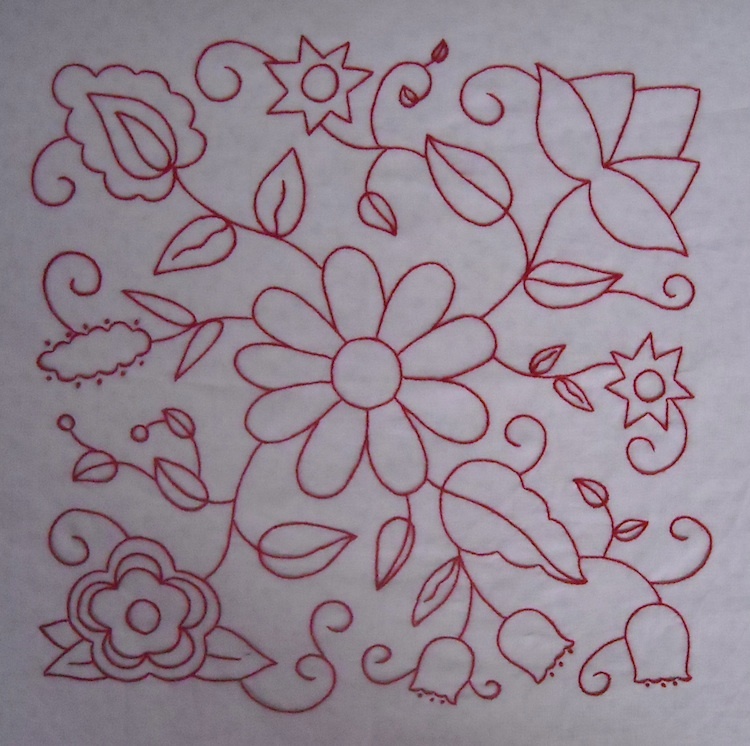 Freezer paper: For making slip-free applique templates. This is optional, however, and I’ll discuss several different ways of making templates as we get started. You can then pick your favorite. Thread: For applique, it’s best to match the thread to the piece you’re sewing down, NOT your background fabric, so you’ll need thread that matches each of your applique fabrics. I generally use Mettler Metrosene Poly Plus, but I also have a few spools of silk and cotton that I use when the color suits me. The silk is expensive, but hides the stitches well. I’ve found that the poly is the next best thing for me, and is much more reasonably priced. It’s all a matter of personal preference and finding what you can afford and what works for you. Scissors: You’ll need paper scissors and good fabric scissors, and I’ve found that in most quilting households, these are not one and the same. My daughters always knew not to use the “good scissors” to cut anything but fabric! Marking pencil: You’ll need a fabric marking pencil that washes out or disappears with ironing. For dark fabrics, I use the Clover White Ball-Point Marking Pen. It rolls on liquid, and the line shows up after it dries. To remove the lines, you press. It makes an easy-to-draw fine line that shows up well on dark fabrics. For light fabrics, I use a Roxanne’s silver marking pencil, and mark as lightly as I can. There is also a new Sew-Line Mechanical Pencil out now that marks really easy fine lines and comes in several lead colors. There are so many choices of marking pencils out there to choose from, you should just experiment with as many as you can to find what you like and what works best for you. Needles: If you’ve never tried applique before, I would not suggest starting out with the tiniest of applique sharps. Try something easy for you to hang on to, and easy to thread; then as you gain experience, you can graduate to the tinier ones (much like you would with hand quilting needles). I use applique sharps, size 12, but they’re very tiny and not easy to thread. Jeana Kimball makes a line of applique needles (straw needles) that are wonderful. If you’re just starting out, however, regular sharps in a size 10 would be a good place to start. Thimble: Your favorite thimble might come in handy for the hand-stitching part. I use these: Greatest. Invention. Ever. But feel free to use what works best for you. Everyone has their own preference. And of course you’ll need your fabrics that you chose, and a healthy dose of enthusiasm. Are you ready? Today I’m going to talk about “Bouquets for Hazel” a bit more, and tell you what to expect and what fabrics you’ll need for your quilt-along quilt. Here’s a repeat picture of the quilt, so you can refer to it while reading. The design for the applique in these blocks is floral in nature, and is very loosely interpreted from pictures and samples of linens from the 1940s and 1950s — linens I imagine the Hyde household might have had during the time of the diary’s writing. 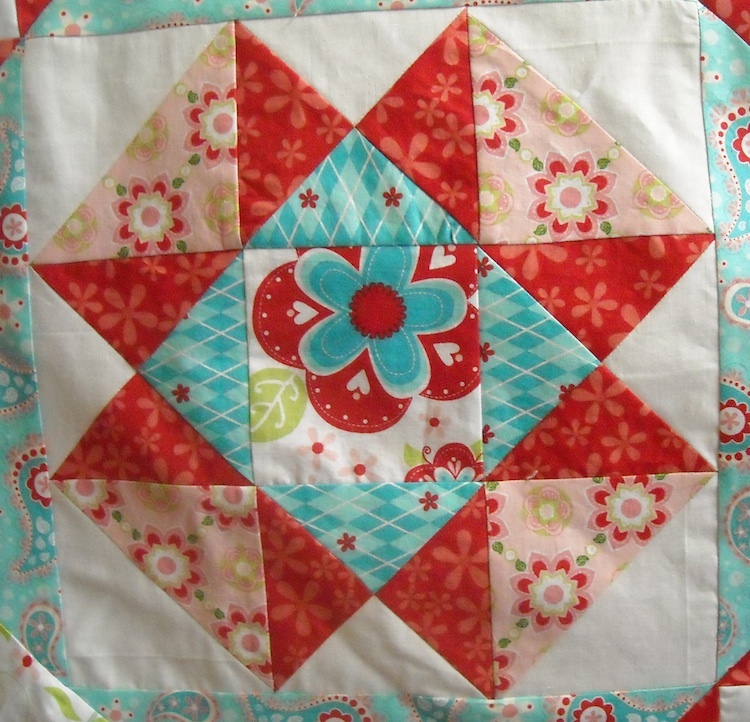 I wanted the quilt to have a bit of a retro 50s feel, but at the same time, I “moderned it up” with bright colors, so it would also be a happy quilt. One thing I noticed when researching old linens, is that the designers were not so very concerned with leaves being green, stems being brown, flower centers being yellow . . . they had every color doing every thing, and it seemed very liberating. So I made all my stems and leaves in unexpected colors, and mixed up all my colors within each block to make it fun. I then designed the center block and the setting triangle blocks to pull the quilt together using all the same colors from the applique. I’m also quilting along with you again this time, making another version of the same quilt in another colorway, so you’ll see those colors of mine as we go along. If you’re new to applique, never fear. I’ll be posting lots of pictures, explanations, tutorials, and related information as we go along, which will hopefully answer any questions you have, and teach you the hand needle-turn method of applique as we go. 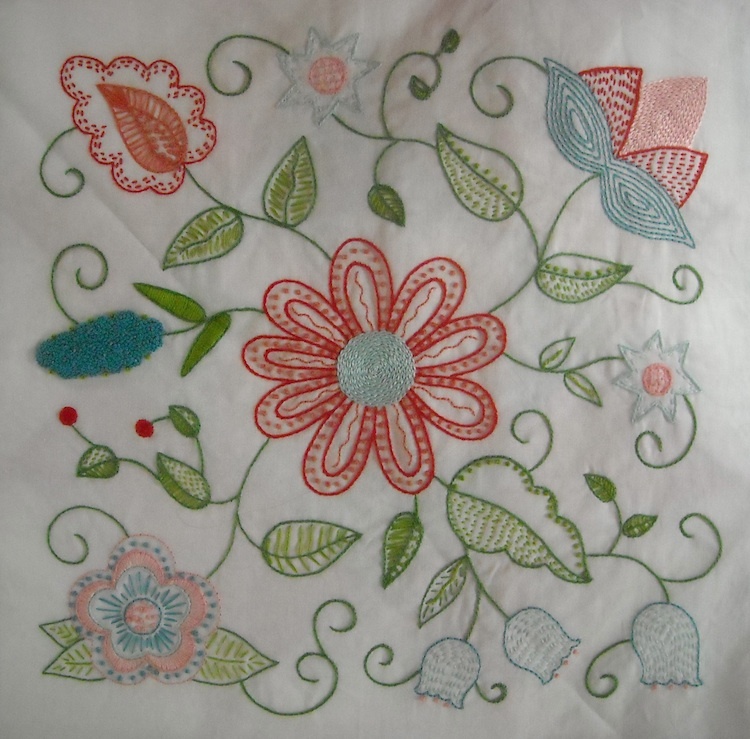 I’ll also discuss the fusible method of applique as well, should you decide you’d rather use that method. When we get to the piecing part, I’ll still provide step-by-step instructions and lots of pictures, so you don’t get lost. If you’re a more experienced quilter, you can just download each pattern and set to work. If at any time you have any questions, you can always contact me and ask. Keep in mind that I’m estimating generously, so if you have shrinkage, mis-cuts, or changes in decisions, you’ll still have plenty of fabric to work with. For the outer border, setting and corner blocks, center block, and some of the applique, pick a focal print. This is the pink print with the circular flowers on it in the picture. We’ll refer to it as Fabric #1, and you’ll need 3 yards. For the inner border, block frames, and some of the piecing and applique (yellow in the sample quilt), which we’ll refer to as Fabric #2, you’ll need 1 1/4 yards. For the applique and pieced blocks background fabric (I used a solid white), you’ll need 1 1/2 yards. We’ll just call this one “background” and not use a number. You’ll also need 3 other colors to do the piecing and most of the applique with. I chose a pink, a blue, and a green. You’ll need 5/8 yard of each one. You can also just use a variety of scraps in colors that coordinate with your border print, as long as you have the correct amounts of the colors you choose. Feel free to be creative here. 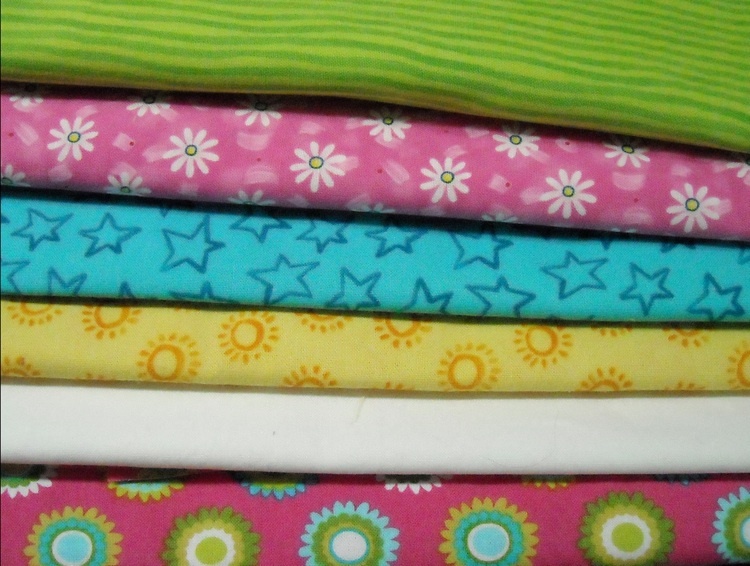 We’ll number these Fabrics 3, 4, and 5, and keep them in order using the swatch sheet I’ll make available a bit later. You’ll also need binding. You can choose one of the colors you’ve already got and get an extra half-yard of it, or you can choose something completely different. You’ll need 1/2 yard. Then, of course, you’ll need backing and batting when all is said and done, but you don’t have to worry about that right at this moment. Tomorrow I’ll do a review of all the tools and supplies you’ll need as we make the quilt, and before we start, I’ll once again make available the downloadable swatch sheet for you to use to keep track of your fabrics on. So . . . I’ll see you tomorrow! Well . . . where to start? I knew at the outset of this project that committing to writing a post a day for almost 4 years was a huge undertaking. I was certainly willing to give it a shot, though, and I did pretty good for awhile, if I do say so myself. What I didn’t expect was that when I fell behind, that I’d fall behind so badly! I took a sick spell back in September, and was pretty sick for about 3 weeks. That put me behind on just about everything, and I simply couldn’t keep up. The poor diary project was one of the things that I let go. I’ve been riddled with guilt about it this entire time, but with the “Christmas rush” of getting quilts and commission jobs done for customers, I just haven’t had time to get back on track yet. But now, I’m hoping to do that very thing, and I sincerely apologize to those of you who came to expect the daily entries and they weren’t there. I also want to thank you for sticking with me this long, and hope you continue to come along for the ride as I catch up and move forward. I have big things planned for the diary blog for 2012. I know I promised another Quilt-Along to go with 1952, and I just never got my act together on that. So . . . for 1953, I’m planning to offer TWO Quilt-Alongs. Please join me in one or both of them. I’ll have more details and pictures on both of them a bit later. For the next couple weeks, I’m going to concentrate on catching up on the daily posts, and hopefully, by the end of the month, I’ll be able to announce the first Quilt-Along, and we’ll get started in January. How does that sound? Please accept my apology, and I hope you’re up to joining in next year’s Quilt-Alongs! I got a bit behind last week posting the entries. I’ve been so busy, and my computer is so slow — it’s not a good combination for getting things done online . . . But I’m caught up, and it’s time to make some big changes. I said at the beginning of publishing this blog that I would never remove any of the quilting instructions without letting you know in advance. I’m just about ready to start posting the information for the next Quilt-Along. It’s a small quilt, with some applique and some piecing, and it’s not going to be a mystery. So I’ll be showing it to you soon, and at that time, I’ll tell you how it will go and what you’ll need in order to Quilt Along with us. Meanwhile, it’s time to take down the instructions for the previous one, since I’ll be having a new one posted. To that end, I will begin removing the instructions for the 1951 quilts (both options) on August 15th, probably a month at a time. If you’re in the middle of making one of these quilts, this should give you time to print out any instructions you’ll need to finish it up, because it’s not my intention to leave anyone hanging. I will be making the patterns available later, I’m just not sure in exactly what form yet, so you can still get the patterns, just keep checking back here and I’ll make sure to let you know how you can get them. I will not be removing tutorials on techniques, so those will remain. I’m not removing past diary entries at this time, and the recipes will all still be posted for now as well. If that changes, I’ll be sure to let you know. If you have any questions, just leave me a comment and I’ll get back to you with an answer. Sometimes I think I can’t stand it here any longer. When I’m out of school & working I want to join the Catholic Church and become a nun. I’ve always wanted to but no one knew. Well, we know now! Luckily for me and my siblings, she didn’t follow through with this plan. But how funny! I wonder what happened to make her think she couldn’t stand it here any longer? Or maybe it’s just teenage-girl hormones? She hasn’t said anything up till now that would have made you think this was coming . . .
It’s another day off from quilting. But I’ll fill you in on the plan for what I hope we’ll be doing next . . . if all goes as I have it planned. Now that we have all the blocks done (with the exception of a little bit to do on Setting Block 6 for you Option 1 folks), the next step naturally is to set them together. However, we have a bit of work to do before we’re ready to do that part, so there will be a little bit of prep work to do to some of the blocks, and at least one tutorial on the techniques we’ll be using to get this final big part accomplished. My plan is to be finished with all the steps of the quilt top before Thanksgiving. That way, you won’t have to be trying to keep up with a daily Quilt-Along during the holidays. Or, if you’re extremely behind, you’ll still have lots of time to get your quilt top completed before the end of the year. I’m also trying to decide how to continue from here, so I’ll be mulling all that over in the next month or two, and am open to suggestions. I want to have a “Quilt Show” of sorts, so that everyone can see everyone else’s finished quilts, possibly have the chance to tell a bit about themselves, their quilt, and their participation, or something along those lines. I’m still thinking . . .
And before I forget, I’ve been asked several times: “What was in the Domestic Bliss package?” I hope Balinda doesn’t mind me spoiling the surprise, since I doubt the package has reached her yet, but it was “something for every room in the house”. For the kitchen, a tea towel; for the living room, a candle; for the bathroom, handmade soap; for the sewing room, a piece of fabric; and for the bedroom, chapstick to make those lips all kissable! And I’ll leave you with this story from the local paper, published on this day in 1951. You remember Hazel talking about listening to Horace Heidt on the radio? How’s this for a news flash? . . .
Bandleader Horace Heidt’s wife, Adaline, has been granted a divorce and half of community property estimated at $600,000. Mrs. Heidt, 38, testified yesterday that her husband’s career as a radio and television headliner has become more important to him than anything else, and that although she sought a reconciliation, he spurned her. She said he telephoned her from New York that unless she gave him his freedom, he would never return to California.